I'm back with the second article this week. I'm really trying my very best to write a useful article every day on my blog because I love to do so.As I grow, mature and become rich in experience, I want to share whatever I learned along the way.I hope this sharing will benefit you and build yourself as a youth. Currently, I'm in Ho Chi Minh city as I write this article(I wrote the article after work) and one thing that I love about travel is I get inspired from everywhere and everything.I saw different thing every day as I travel using a taxi to work using the different road every day. 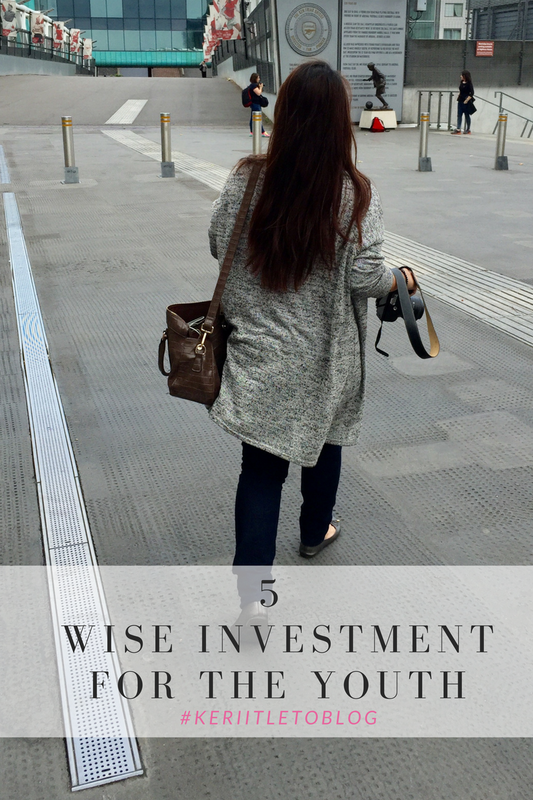 So based on my experience and reading ( I love reading), I want to share about 5 wise investment you can make during your youth time. When we talked about investment, it's not just about money.There so much more in this life that more than money. Youth is known to be a period of exploration and self-discovery. There is no better time than now to discover your uniqueness and develop yourself further. One way to start doing is joining organizations or communities with whom you share the same passions and who would willing to support you and lend you advice.As for me, I do this in my school and church. I met many friends and learn much more in my school and church on weekend. As you grow yourself and expand your connections, you will come across situations that will change you to go beyond your comfort zones. Eventually, you'll learn that life is about stretching your horizons day by day, and moment by moment. It's also about building your capability to maturity. As a young person, you might have plenty of friends at this point in your life. You have your steady set of classmates you meet throughtout the year where you like them or not.But as you face that transition period from student life to career life later on, your inventory of friends would inevitably narrow down.You'll find yourself with a good friends from childhood or high school. Another relationship which is far more important to take care of is that of the family.We may have some issues with our family but in the long run, it will be our family who would stick with us and love us unconditionally regardless how far we go in life or how much we mess up. Young people are known to hurry into entering relationships.Once they feel the first flurry of emotions, they jump in head over heels without thinking whether it's the best decision to make all the moment or not. That's totally me when I'm much younger. I saw a lot of my friends getting boyfriend and I don't have one so I feel lonely and think I'm not normal(hahaha..funny to me now! ).But, I'm thankful I met a great person for my first love. As old fashioned as it may sound,purity in mind,word and deed is the key in enjoying your relationship with your future spouse.God,Himself,instituted marriage and designed it to be beautiful and enjoyable by the spouses protected by the vow of commitment and enduring love.Imagine facing your future spouse to be before the altar someday without the regrets and past hurts haunting you.Don't trade your long term happiness with temporary pleasures that tempt you at the moment.Always keep in mind that your future relationship is benefit from this. I'm thankful as I was sturdy belief in God despite of a lot of voices that can distract me from Christ. Having strong belief in God is essential.Our spirituality strongly influences our lifestyle.Making sure where you are grounded morally and spiritually will keep you sound when life gets rough along the way.Taking time to meditate, reflect and learn will help you get through trials you will surely meet in your daily life. It is said that 90% of an iceberg is invisibly submerged in water.That is what makes it dangerous to sailing ships.The same is true with a person's character.It composes 90% of the person's totality yet is it hidden from the eyes.It is the primary determinant of what types of situations can make or break that person.It is because that 90% composes the mental,emotional,spiritual and moral qualities of an individual. It can refer to characteristics like humility,courage,courtesy,patience,politeness,faith,pro-activeness adn perseverence- things which are easy to overlook but definitely essential in achieving victories in life however great or small. As young people, value the time when you still have plenty of room to make mistakes and receive correction as these are the keys to honing your maturity as a person. As you grow older, you will realize that life is not only about managing time but about managing your precious energy as well. There would be plenty of trade-offs in priorities you need to deal with along the way because there will come a point when you will finally realize you're not a superhuman. They key is in prioritizing what matters most in this life from those which don't really return any profit at all. Knowing when to juggle, which ones to juggle or to simply throw it away and move on empty handed is a skill we all need to acquire over time. I hope this sharing is useful and give benefit to you. Don't forget to share with other if you feel it's benefit to you so we can learn together for a better us. [Source] : Wise investment for the Youth Plans on YouVersion Bible.